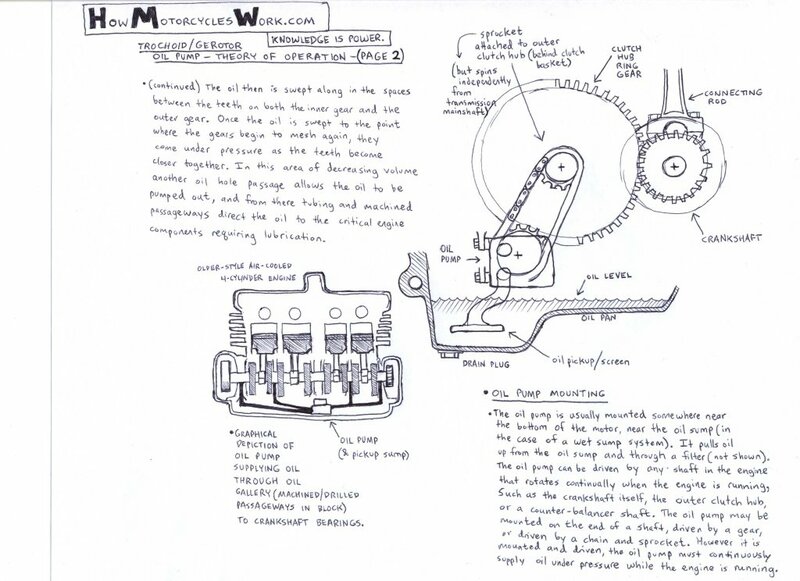 how motorcycles work.com knowledge is power trochoid/gerotor oil pump theory of operation page 2 (continued) the oil then is swept along in the spaces between the teeth on both the inner gear and the outer gear. Once the oil is swept to the point where the gears begin to mesh again, they come under pressure as the teeth become closer together. In this area of decreasing volume another oil hole passage allows the oil to be pumped out, and from there tubing and machined passageways direct the oil to the critical engine components requiring lubrication. Older-style air-cooled 4-cylinder engine. Graphical depiction of oil pump supplying oil through oil gallery (machined/drilled passageways in block) to crankshaft bearings. sprocket attached to outer clutch hub (behind clutch basket) (but spins independently from transmission mainshaft) clutch hub ring gear connecting rod crankshaft oil pump oil level oil pan oil pickup/screen drain plug oil pump mounting the oil pump is usually mounted somewhere near the bottom of the motor, near the oil sump (in the case of a wet sump system). It pulls oil up from the oil sump and through a filter (not shown). The oil pump can be driven by any shaft in the engine that rotates continuously when the engine is running, such as the crankshaft itself, the outer clutch hub, or a counter-balancer shaft. The oil pump may be mounted on the end of a shaft, driven by a gear, or driven by a chain and sprocket. However it is mounted and driven, the oil pump must continuously supply oil under pressure while the engine is running.